Like it or not the holiday season is here. 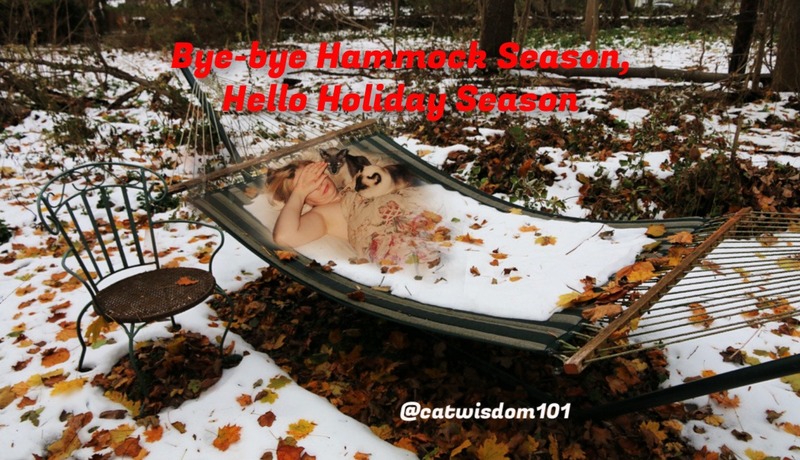 I’m still in the mood for hammocks and wasn’t it just Halloween yesterday? We’re having the whole gang chime in today. 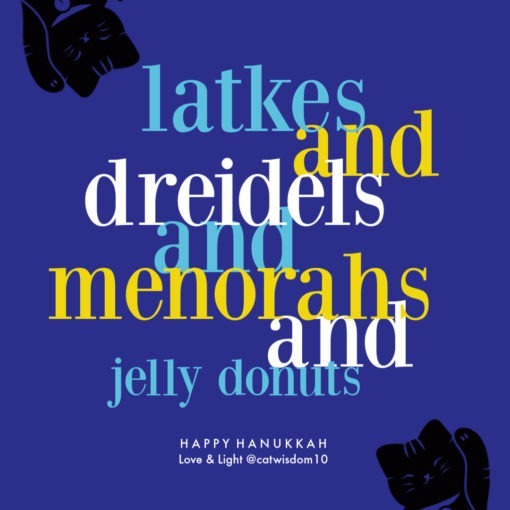 For all our Jewish friends, may Hanukkah be bright, light and a little greasy. You don’t have to be Jewish to enjoy the traditional jelly donuts. Yum. Yup, this was our garden last week. 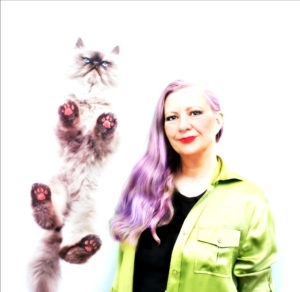 I found an old photo of me with Angels Merlin and Coco way back at the beginning of my blogging days. 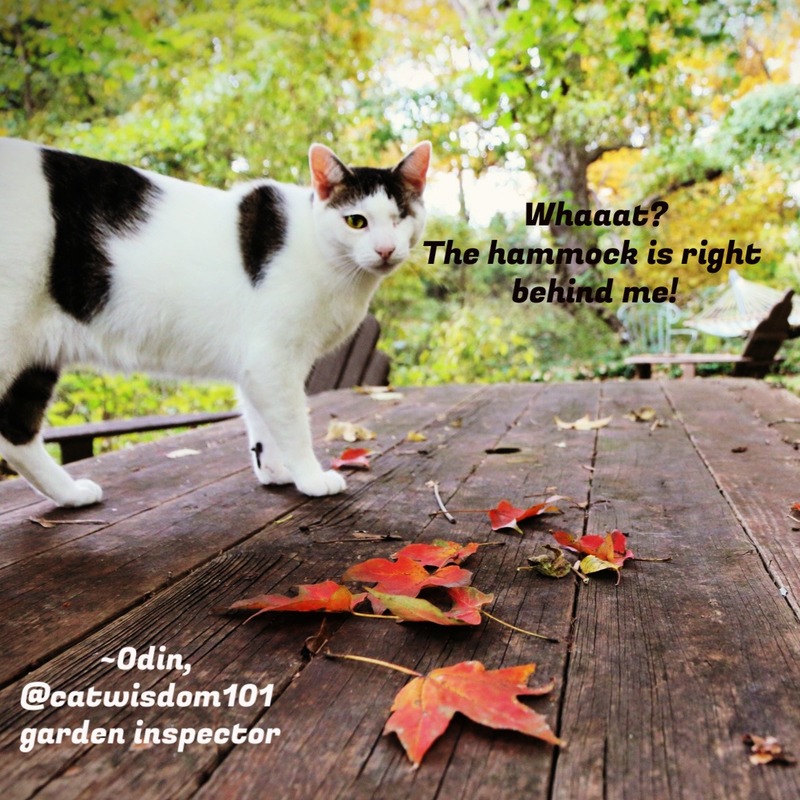 Merlin and I loved hammocks and while Odin occasionally hops aboard, he’s more interested in hunting. He’s must be getting older since I haven’t seen him climb any trees since summer. How fast the world is spinning these days. 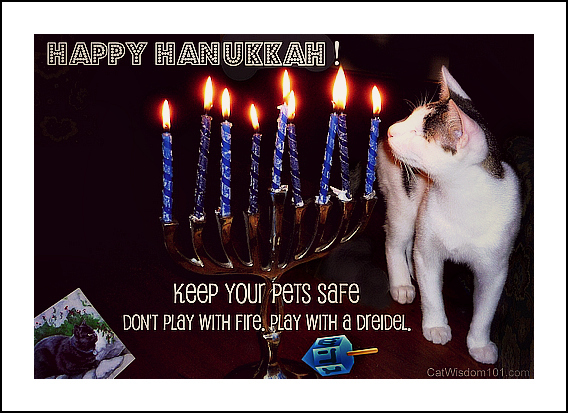 It feels like yesterday when Odin become our annual poster boy for Hanukkah candle safety. Well, we know who the boss is around here. It’s been two years and he still hates any camera. He did look quite dashing last year for Hanukkah. We’ve been doing more undercover snuggling which is new. Maybe he’s getting old. Wait, he is old. I can’t believe he’s going to be 19 next month! Neruda poetry? Coming right up. Part of the longer poem by Pablo Neruda titled Finale with translation translated. (Painting section part of triptych by Layla Morgan Wilde). enormous, inside your brief hands. The holiday season will pass in a flash as always for better or worse. It's better with more light, friends and donuts. 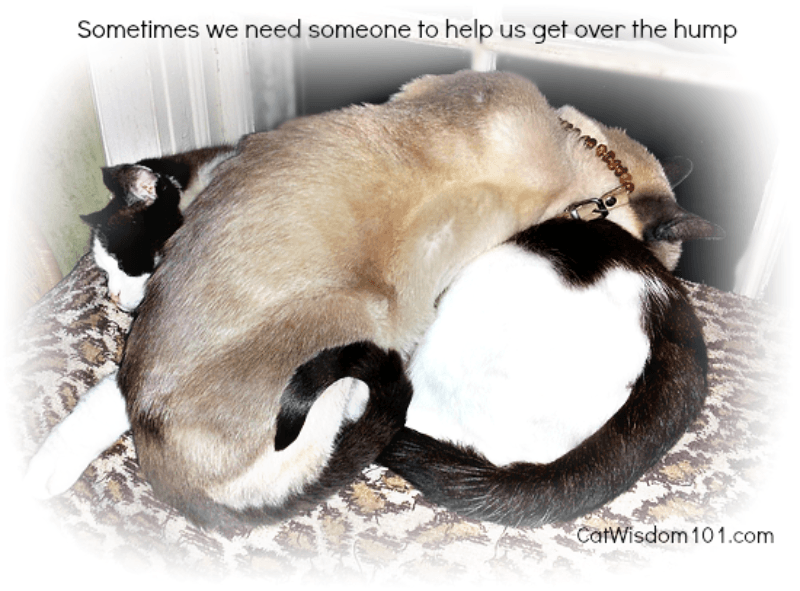 Don't forget to do less, feel less guilty and snuggle your cats more. P.S. 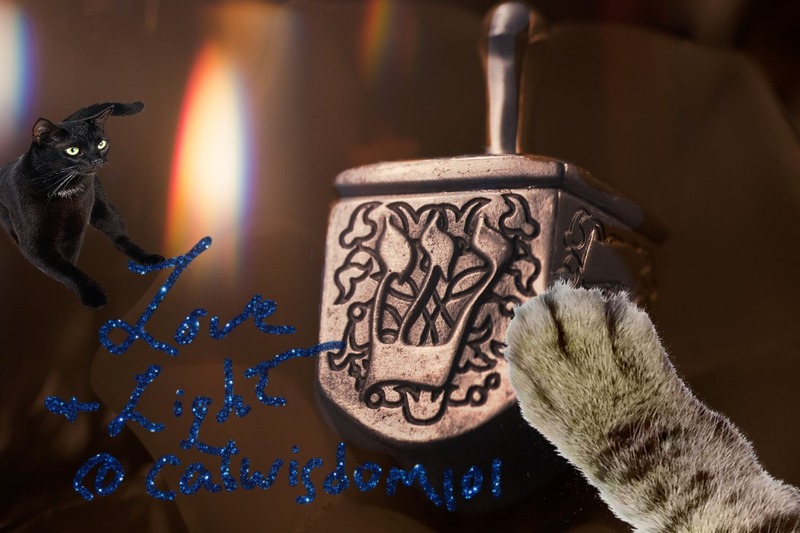 Dreidels, the little spinning tops make great cat toys. I like the wooden ones (@ $1.00 each, less in bulk). We love the pics. The holidays, and every day go by the excellrated speed with each passing year. We are getting old too and time is leaving it in it’s dust. We love more and more snuggle time too. PJ’s and bedtime or time on the couch are such a comforting thought these days. Happy Hanukkah! 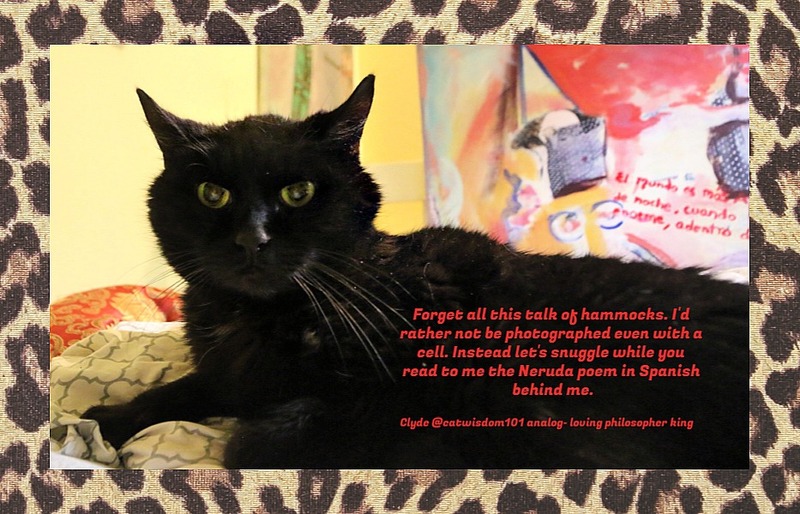 Clydie, you are such a mancat of mystery, and so handsome, but we understand about not liking the camera. Lovely photos, especially Merlin draped over Domino.